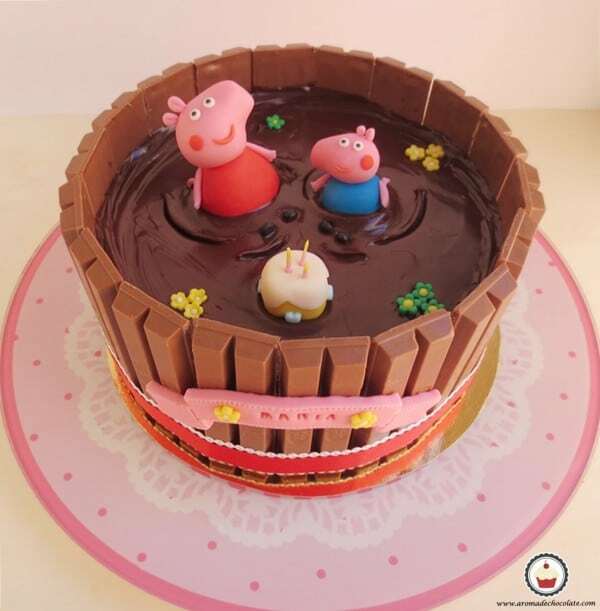 Does your child want a Peppa Pig Birthday? Delight your little one with these fun and creative Peppa Pig Birthday Party Ideas! Peppa Pig is one of the most popular kids cartoons these days, and it’s no wonder why! Peppa and her friends go through all sorts of fun adventures that kids themselves love to do like going swimming, riding bikes, and having fun with their family and friends. These cute characters are definitely a hit with a lot of kids. If your little one loves watching the adventures of the lovable Peppa, her brother George, and their family, why not plan a fun Peppa Pig Birthday?! Find the best inspiration to start planning your Peppa party with these 16 Peppa Pig Birthday Party Ideas! 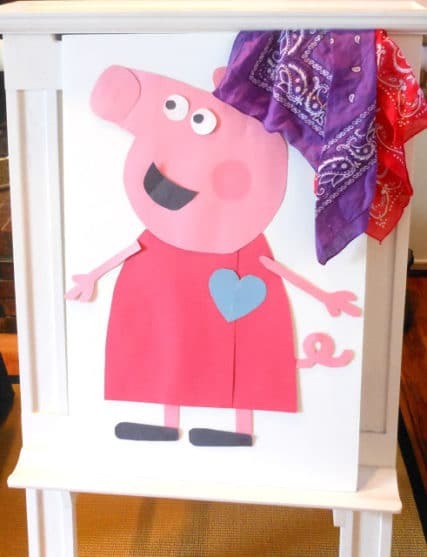 There are tons of fun and creative Peppa Pig Birthday Party Ideas. 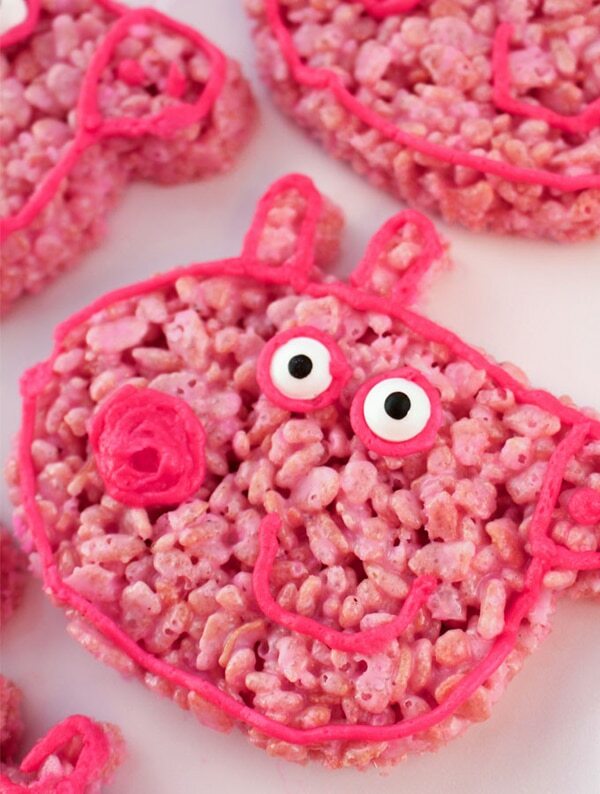 You can focus on Peppa Pig and craft some pig inspired party cups or whip up come Peppa Pig rice krispies. The bright, colorful party decorations and sweet dessert ideas will make this a party your child will never forget. 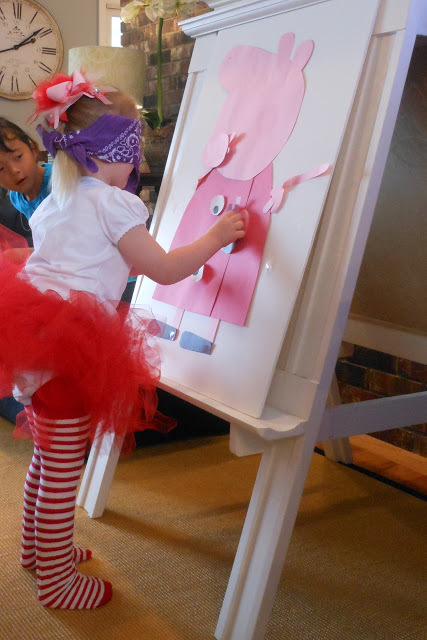 Check out more Peppa Pig Birthday Party Ideas below! 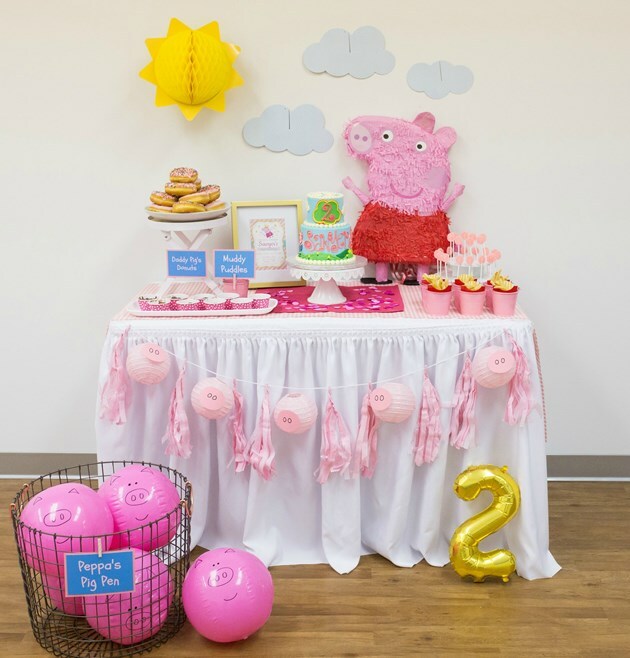 Party Idea #1: How adorable is this Peppa Pig Dessert Table?! We love everything from the tablecloth to the backdrop to the cake! The fun and colorful spread really looks like it came straight from the show to your party. From the cute cupcakes with purple frosting to the gorgeous Peppa Pig birthday cake, this awesome dessert table is a must-have for your children’s Peppa Pig party! Party Idea #2: These cute pig ear headbands will definitely complete your kid’s Peppa Pig birthday outfit and their friends too! They will surely have fun pretending to be Peppa and George with these easy to make felt tip piggy ears. 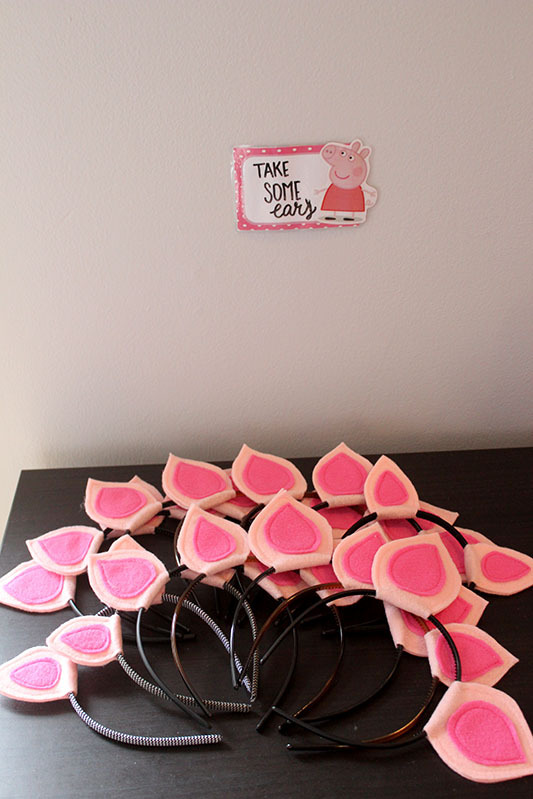 Make these fun DIY Peppa Pig Ears for guests to wear at the party and take home as party favors! Party Idea #3: We can’t get over how cute this Peppa Pig Birthday Cake is! Look how much fun Peppa and her younger brother George are having playing in muddy puddles in this adorable birthday cake. If you want to know how to make a Peppa Pig birthday cake, this easy to follow tutorial will show you how to make this birthday cake step by step. The base sponge cake follows an orange truffle cake recipe that tastes absolutely amazing. The Peppa Pig and George Pig cake toppers are also made from scratch using some pink, red, blue, white, and black fondant. If you have some fondant left over, you can even make the whole pig family to add more cute decorations to your cake. From the Kit Kat fence to the cute cake topper animals, this delicious, orangey and chocolatey cake is perfect! Party Idea #4: Are you having a hard time finding ready-made Peppa Pig party supplies in the stores? 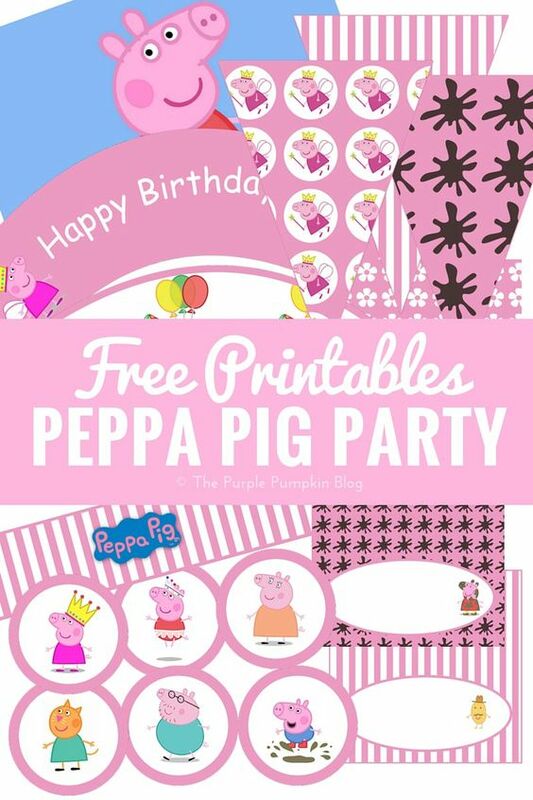 Grab these Free Peppa Pig Printables for your birthday party! 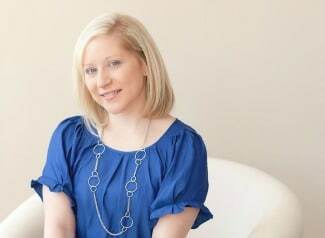 They are super easy to assemble, and they will save you money too! From party flags to food labels, you will find everything you need for your Peppa Pig party decorations here. 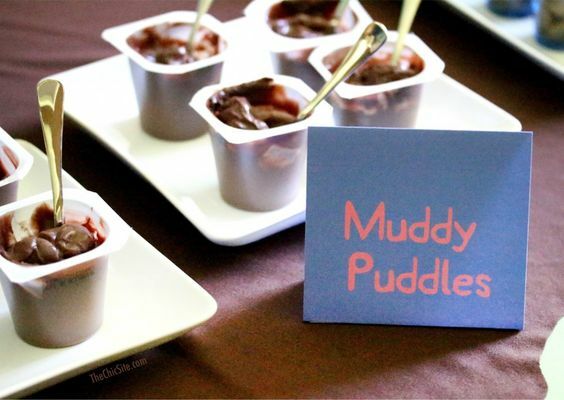 Party Idea #5: You definitely have to serve “Muddy Puddles” Pudding at your Peppa Pig party! You can just use any regular old chocolate or Nutella pudding and label them as muddy puddles. Your children’s friends will definitely have a lot of fun eating their muddy puddle pudding cups at the party. Party Idea #6: Want an easy to make but super yummy food for your child’s Peppa Pig themed party? 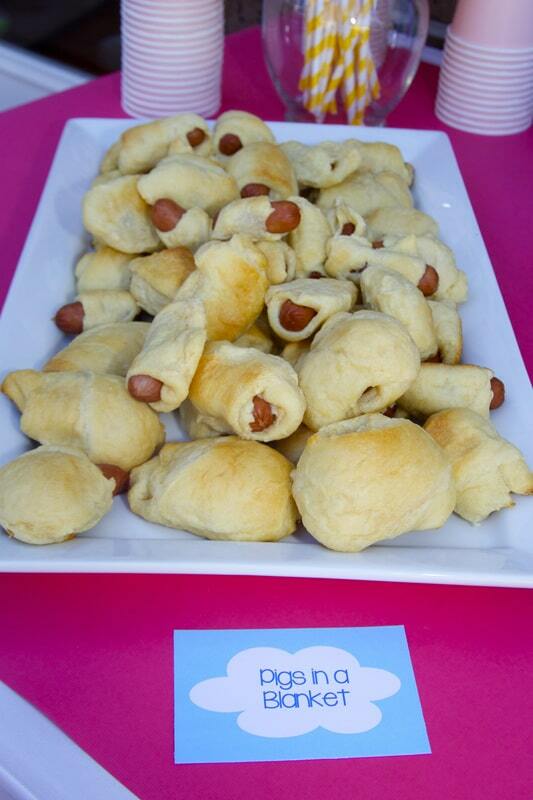 There’s nothing better to serve than Pigs in a Blanket at your Peppa Pig party! You don’t even have to buy any special ingredients to make them. Your party guests will never go hungry with these delicious snacks. Party Idea #7: Need ideas for Peppa Pig birthday games? This Put Peppa Back Together Game will have the kids at the party entertained and having fun! It’s super easy to make by yourself as well; all you need are some construction paper, glue and tape, and a piece of foam board. Party Idea #8: It’s all in the details! 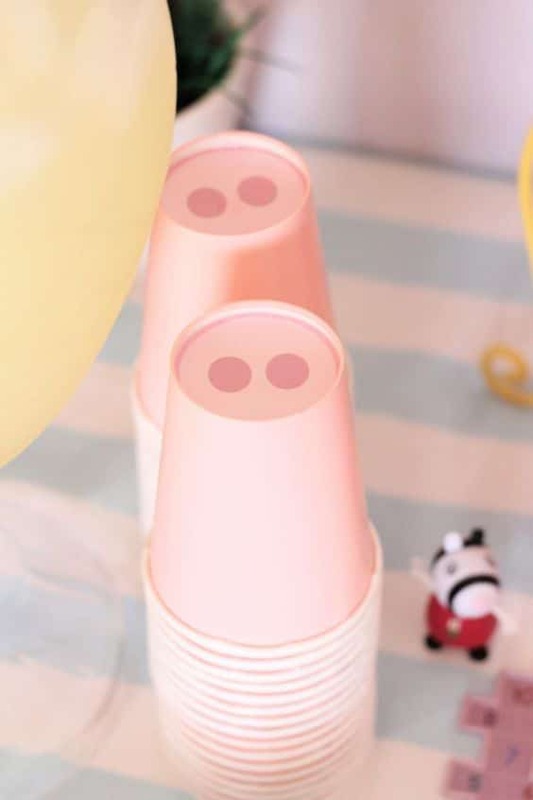 These DIY Peppa Pig Party Cups are a super simple idea for your party, but they definitely make a big impact! If you’re looking for Peppa Pig birthday ideas that don’t take too much work or effort, these are definitely perfect for you. Party Idea #8: It’s all in the details! These DIY Peppa Pig Party Cups are a super simple idea for your party, but they definitely make a big impact! If you’re looking for Peppa Pig birthday ideas that have that cute factor, these are definitely perfect for you. Party Idea #10: Want cake ideas for a standout Peppa Pig party? This pretty Peppa Pig Cake is fit for a princess! This beautiful tiered cake is made up of a 5″ chocolate cake with dark chocolate ganache and a 7″ white chocolate vanilla cake with white chocolate ganache. 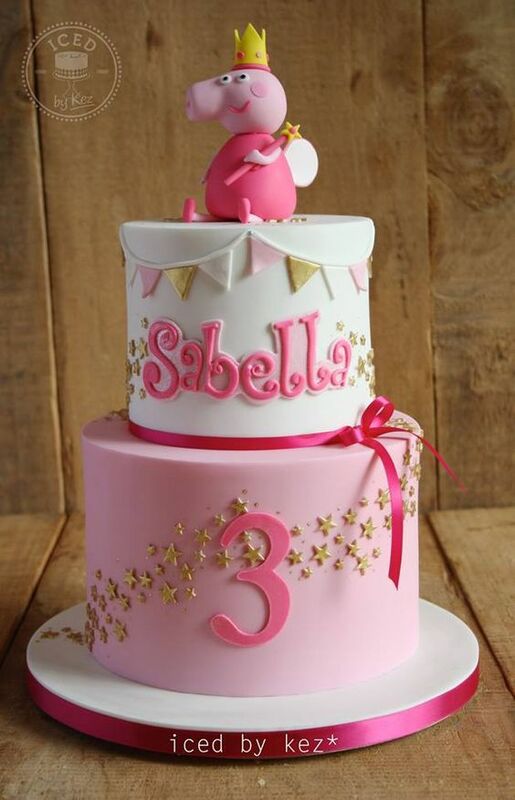 The gold stars make this cake extra classy too and definitely perfect for a Peppa Pig loving princess. Sounds delicious, right? This cake will surely be a hit for both young and the young at heart at your party! Party Idea #11: Looking for more cake ideas for your little princess? Here’s another darling Princess Peppa Pig Cake! 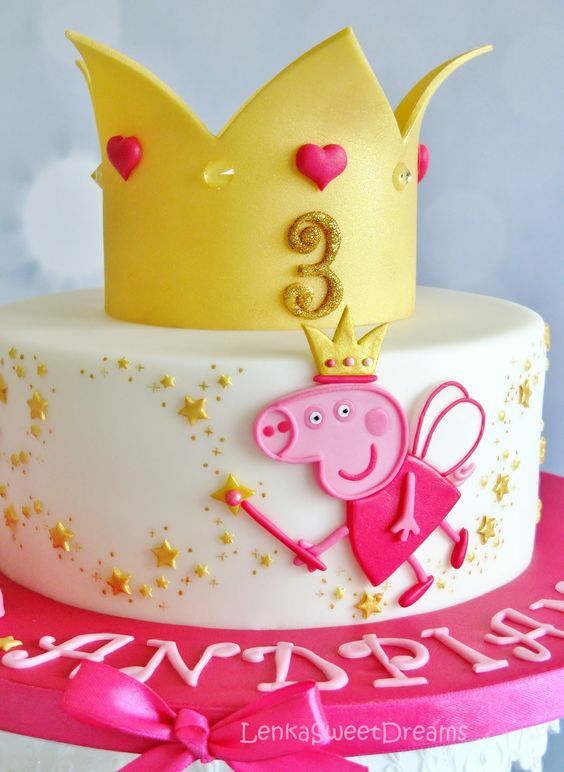 Everything about this cake screams royalty, from the beautiful golden crown to the adorable Peppa Pig fairy decoration, this cake will surely be the highlight of your birthday party table spread. The golden crown even has a hint of sparkle to make it really pop! Party Idea #12: If you’re looking for more scrumptious treats to add to your dessert table, why not try your hand at making these yummy cookies? 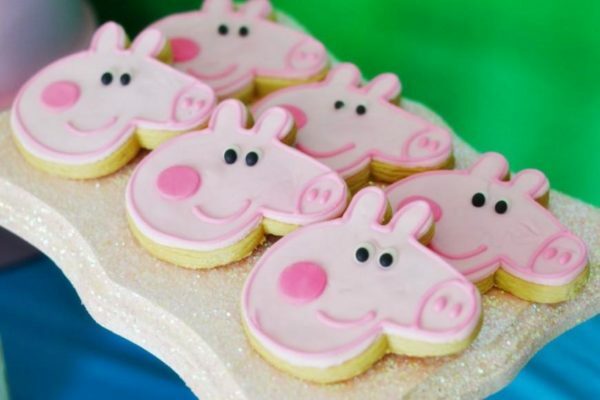 These cute Peppa Pig Cookies would look perfect next to your cake on the dessert table. These Peppa Pig sugar cookies are easy to make with any basic sugar cookie recipe you have. All you need to decorate them are pink colored icing and some googly eyes! 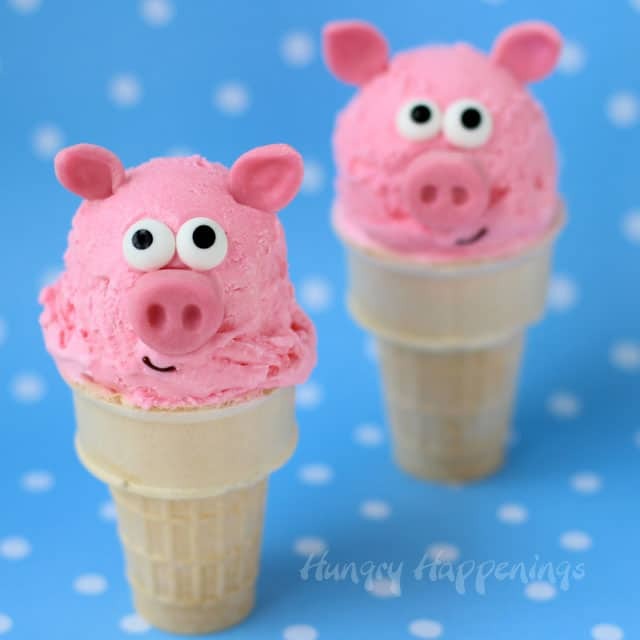 Party Idea #13: The kids would get a kick out of these Pink Bubblegum Pig Ice Cream Cones. How adorable are these?! These sweet treats are not just delicious, they look amazing as well! They are definitely one of a kind birthday party treats that your guests will enjoy. You can make your own bubble gum ice cream recipe too if you don’t like the commercial bubble gum ice creams that have too many bubble gum bits in them. If you’re having your child’s birthday party in the summer, then these adorable Peppa Pig bubblegum ice cream cones are a must have! Party Idea #14: We LOVE these Peppa Pig Balloon Decorations! They really make a statement and bring the party to life. At the end of the party, you can give out the balloons as a party favor to your guests as well, so they won’t go to waste! To make it even more amazing, you can add a Peppa Pig banner to the setup and even have a personalized Peppa Pig birthday shirt for your little one! 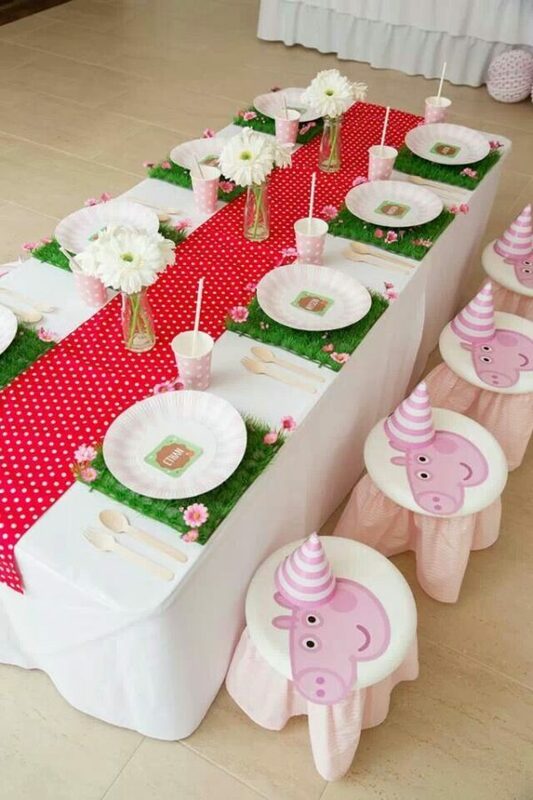 Party Idea #15: This sweet Peppa Pig Party Table Setting is perfect for your little guests. If your child loves pretty and dainty things, this table setting is right up your alley. Make sure to send out cute pink Peppa Pig invitations to your children’s guests to to really complete the theme. Party Idea #16: Here’s another great idea for a Peppa Pig Cake Table. 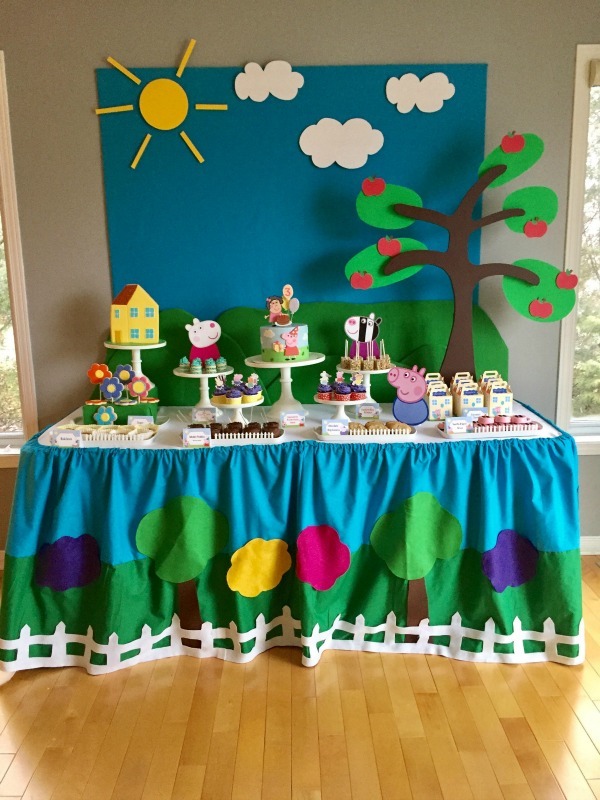 The great thing about this party table setting is that you don’t have to spend a lot of time looking for ready-made Peppa Pig themed birthday supplies. All you need are some pink balloons or lanterns, pink construction paper and a marker to make cute Peppa Pig balls at Peppa’s Pig Pen. Some pink lanterns, cloud cutouts, and the yellow sun lantern complete the setup, and they are pretty easy to DIY as well. Planning a Peppa Pig themed birthday party doesn’t have to be difficult! With these 16 amazing Peppa Pig birthday ideas, you can easily complete your menu, dessert table, decorations, and party games for your little one’s Peppa Pig party. 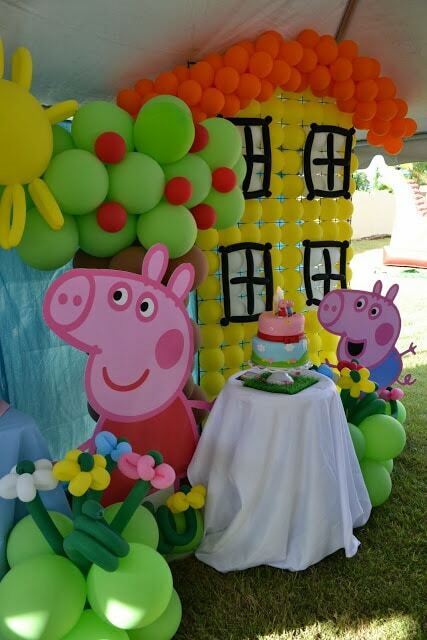 Which of these 16 Peppa Pig Birthday Party Ideas are your favorites? Let us know in the comments below. For more party ideas, don’t forget to follow us on Instagram @prettymyparty and Pinterest and join us in our private Facebook group. Where did you find the Peppa Pig tablecloth?